The crashed motorbike on the Constantine main road, bodies in the foreground. Police have confirmed that 2 men are Grenada’s latest road fatalities. 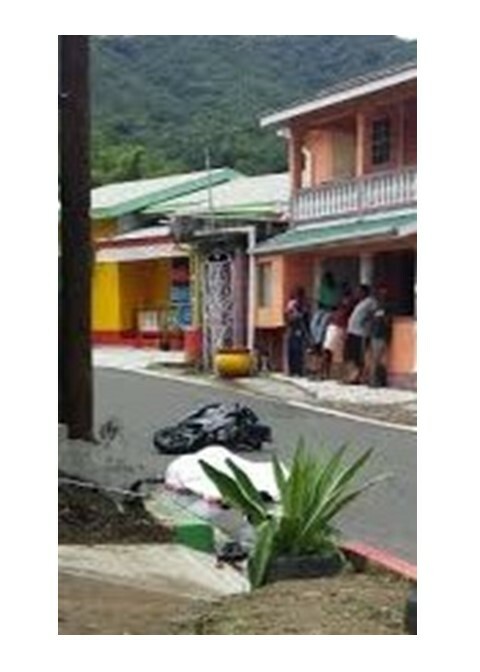 The accident occurred on the morning of Sunday, 2 July, near to a well-known spice shop on the Constantine main road, in an area recently expanded and resurfaced. The men were discovered on the road not far away from where the motorbike crashed, and have died from injuries sustained in the crash. Police were unable to confirm if the men were wearing helmets at the time of the accident. The names of the deceased are yet to be disclosed, but they are both said to be residents of the village of Birchgrove. The La Qua Brothers and Otway/Bailey funeral agencies are handling the separate arrangements.